Available in Top-Loading and Bottom-Loading versions - both look great! 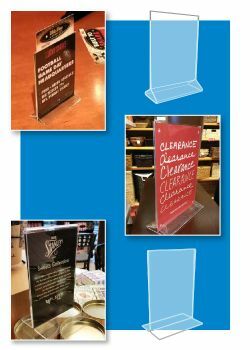 Top Loading: 5" x 7" and 8.5" x 11"
Bottom Loading: 5" x 7" and 8.5" x 11"
These T-Style Acrylic sign holders are very popular POP signage hardware in the hospitality business at restaurant and food service establishments where there is a consistent need to change messages such as menu items, sales or promotions. Of course, any industry can benefit from the use of these versatile countertop sign holders. Retail product display materials and POP Signage hardware manufactured by Clip Strip can be trusted to help marketers communicate effectively at the point of purchase. 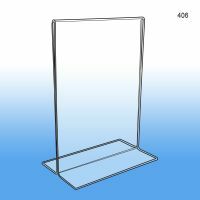 We carry a large variety of acrylic sign holders to meet all your needs. 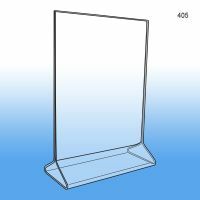 Need PRINTING for what you place in these Acrylic Countertop Sign Holders, ask Clip Strip Corp. to quote on your specifications. We have a full service POP Printing division to help meet your printing needs! Clip Strip Corp. is a full service sign holder manufacturer and distributor with an ever-growing line of products. 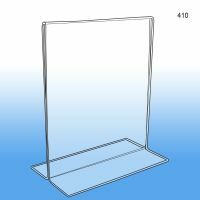 Countertop signage holders, as per the T-Style Acrylic's category, are only one of many types we have on this site. 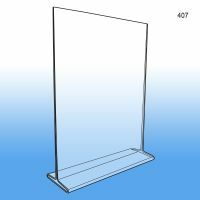 Browse our sign holders main section and check out our product pictures, videos and detailed descriptions to find out what else works for you.